Power up your phone with this Star Wars Mighty Minis Boba Fett Portable Charger! It may look like a little action figure, but it's actually a portable charger that gives you that extra juice when you need it. 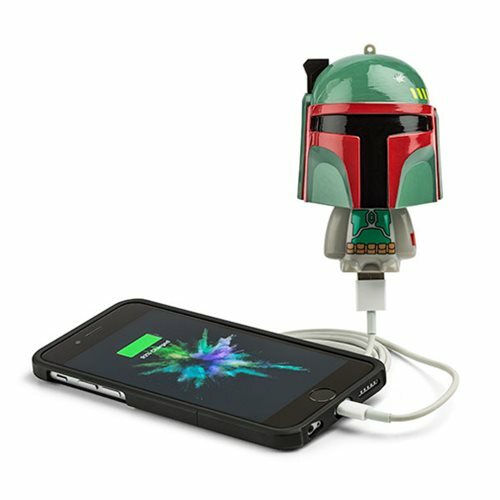 Hang it on your keychain or backpack and this Boba Fett will make sure you have up to 3 extra hours of battery life on your phone. When you aren't using him, use the on and off switch to save the power and when he runs out, change the batteries for a fresh charge. Never run low on power again with this Star Wars Mighty Minis Boba Fett Portable Charger! This handy portable charger measures about 4-inches tall x 2 1/2-inches long. Requires 2x "AA" batteries (not included) and does not come with a USB cord. Not intended for large mobile devices and tablets. Ages 13 and up.